Photo by Maria Baranova. Featuring Andrew Schneider and Alicia Ohs. “Hallucinatory. Psychotropic. Miraculous” (The New York Times). Andrew Schneider's technical theater masterpiece examines the last burst of human thought before entering the afterlife. 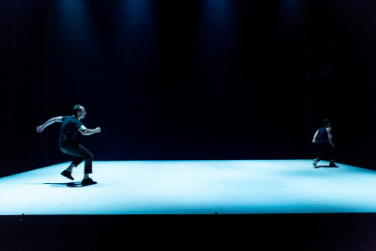 AFTER commands mind-bending light and sound effects, and physical performances riddled with humor and intelligence. This journey engages all the senses to determine where the human experience stops, how it gets there and what comes after.